Earring styles go in and out of fashion depending in large part on whether current hairstyles cover or expose the ear. Earrings comprising natural gemstone crystals make their appearance in Rome, c. 2nd century B.C.E. 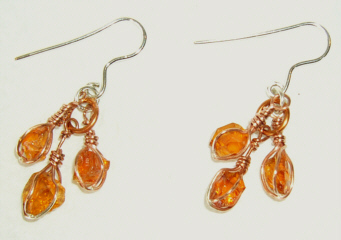 These earrings are based on c. 1.8 gms of faceting-grade natural Citrine crystals. Each crystal has been hand-wrapped in pure Copper wire to best display it's natural growth planes. The Sterling Silver ear-wires are also handmade on the premises.